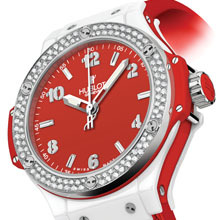 Red - the colour of undying love, on a dazzling, feminine and elegant Big Bang. The Art of Fusion emanates in all its glory from this watch created as an expression of true love : a crimson dial decorated with a diamond bezel, a white ceramic case and an alligator leather and rubber strap. A gift that says more than any poem, a dress watch that proclaims love better than any words!